Dextrocardia is a condition in which the heart is pointed toward the right side of the chest. Normally, the heart points toward the left. The condition is present at birth (congenital). During the early weeks of pregnancy, the baby’s heart develops. Sometimes, it turns so that it points to the right side of the chest instead of the left side. The reasons for this are unclear. There are several types of dextrocardia. Many types involve other defects of the heart and abdomen area. In the simplest type of dextrocardia, the heart is a mirror image of the normal heart and there are no other problems. This condition is rare. When this occurs, the organs of the abdomen and the lungs will often also be arranged in a mirror image. For example, the liver will be on the left side instead of the right. Some people with mirror-image dextrocardia have a problem with the fine hairs (cilia) that filter the air going into their nose and air passages. This condition is called Kartagener syndrome. The abdominal and chest organs in babies with dextrocardia may be abnormal and may not work correctly. A very serious syndrome that appears with dextrocardia is called heterotaxy. In this condition, many of the organs are not in their usual places and may not work properly. For example, the spleen may be completely missing. The spleen is an important part of the immune system, so babies born without this organ are in danger of severe bacterial infections and death. In another form of heterotaxy, several small spleens exist, but they may not work correctly. Possible risk factors for dextrocardia include a family history of the condition. There are no symptoms of dextrocardia if the heart is normal. A complete mirror image dextrocardia with no heart defects requires no treatment. It is important, however, to let the child’s health care provider know the heart is on the right side of the chest. This information can be important in some exams and tests. The type of treatment needed depends on the heart or physical problems the infant may have in addition to dextrocardia. If heart defects are present with dextrocardia, the baby will most likely need surgery. Babies who are very ill may need to take medicines before they can have surgery. These medicines help the baby grow larger so surgery is easier to perform. The baby might also need surgery to correct problems in the organs of the abdomen. Children with Kartagener syndrome will need repeated treatment with antibiotics for sinus infections. Children with a missing or abnormal spleen need long-term antibiotics. All children with heart defects may need to take antibiotics before surgeries or dental treatments. Babies with simple dextrocardia have a normal life expectancy and should have no problems related to the location of the heart. 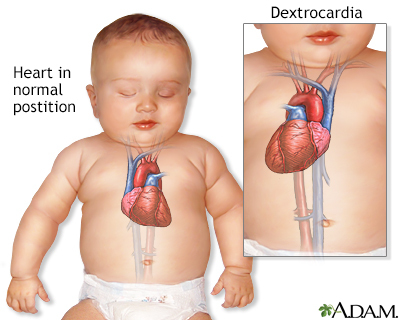 When dextrocardia appears with other defects in the heart and elsewhere in the body, how well the baby does depends on the severity of the other problems. Babies and children without a spleen may have frequent infections. This is at least partially preventable with daily antibiotics. Some syndromes that include dextrocardia may run in families. If you have a family history of heterotaxy, talk to your provider before becoming pregnant. There are no known ways to prevent dextrocardia. However, avoiding the use of illegal drugs (especially cocaine) before and during pregnancy may lower the risk of this problem. Talk to your provider if you have diabetes. This condition may contribute to your risk of having a child with certain forms of dextrocardia. The heart is almost always located in the left side of the chest. Dextrocardia is a condition in which the apex of the heart is directed towards the right side of the chest. Dextrocardia can also cause the heart to develop in a mirror image of the normal heart. In the more common types of dextrocardia, heart defects are present in addition to the abnormal location of the heart.